These cookies are thin and crispy, full of orange and ginger flavor—basically everything I have missed in a cookie for four years since I went gluten-free. 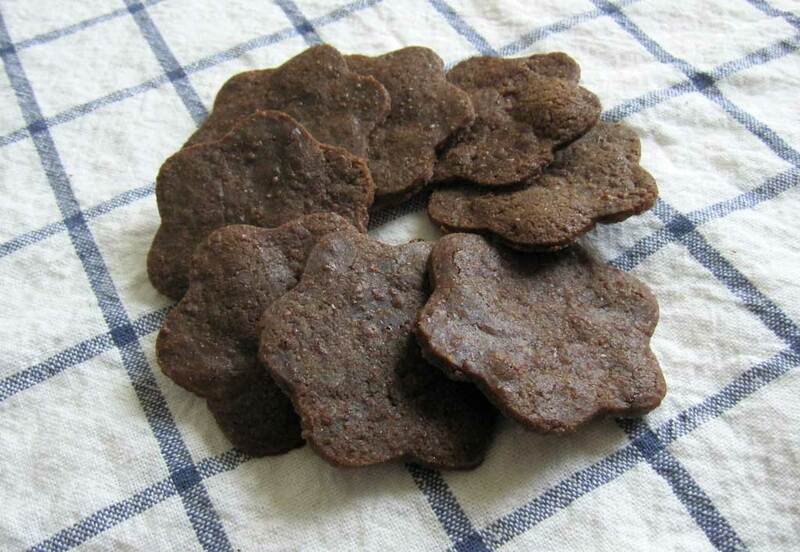 Now after numerous tries, I can present to you my gluten-free version of Moravian ginger cookies. It took six tries to convert this gluten recipe. I was looking for the perfect snap from a thin crisp cookie. The first batch looked like lace cookies when they came out of the oven. They spread a LOT, had giant holes, and were very chewy. Which is fine if you want lace cookies but sooooo not what I was going for! In my oven, the right baking time was exactly 9 minutes. Otherwise, they were chewy in the center or hard on the edges. You’ll have to test to discover the sweet spot for the baking time in your oven. You won’t be able to tell if they got crisp enough until they cool completely. This recipe does require a little bit of love to come out right but it’s so worth it. You get like a million cookies out of each batch! Don’t feel too bad for me having so many failed attempts to get the right texture. I have discovered that this dough makes excellent cookie dough bits…in chocolate ice cream. Yum! It’s totally safe since the recipe is egg-free. If I discover a baking time and temperature that works on a regular baking sheet, I’ll come back and update the recipe. Meanwhile, Americas Test Kitchen recommends stacking 2 uninsulated baking sheets to get the same insulating effect as an insulated baking sheet. I have not tried this yet. If you try it, please report back in the comments! Remove from heat; while still warm, stir in dry ingredients. Cool then place into gallon-size zipper bag. (Roll out the cookie dough inside the zipper bag after it has cooled but before refrigerating. It rolls much easier.) Refrigerate overnight or as long as a month. Preheat oven to 350°F. 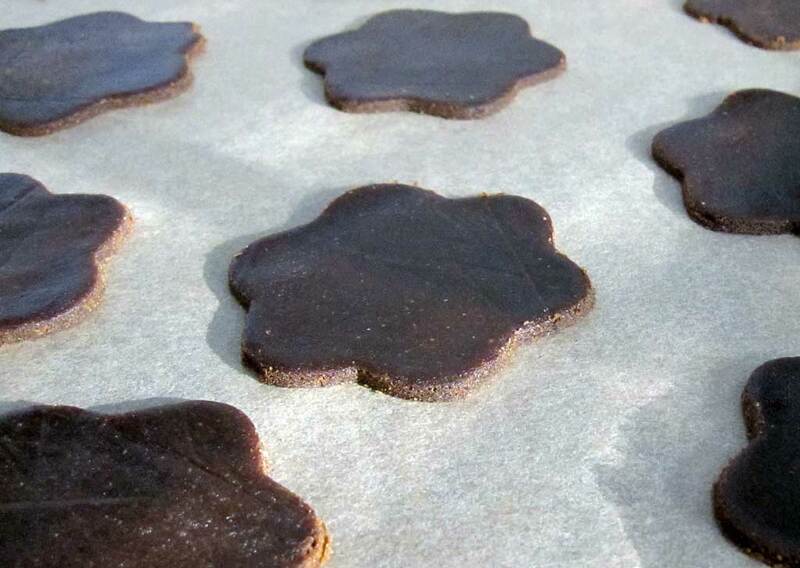 Parchment-lined insulated cookie sheets. When read to bake, take only as much dough as you will need out of the refrigerator. Roll dough out tortilla thin inside the zipper bags or between 2 layers of parchment paper and cut with cookie cutters. No additional flour will be required. Place onto prepared cookie sheets with an offset spatula. The cut cookies transfer to the sheet easier if the dough is still cold. Bake 8-10 minutes. After removing cookies from oven. Let cool briefly on cookie sheet, then transfer cookies and parchment paper to cooling rack. Cool completely. Store in airtight containers or freeze. I do not recommend using an un-insulated baking sheet for this recipe. The thinness of the cookie makes it hard to get the inside and the edges evenly baked so an insulated baking sheet is required. Americas Test Kitchen recommends stacking 2 uninsulated baking sheets to get the same insulating effect as an insulated baking sheet. I have not tried this yet. This post was shared on No Rules Weekend, Flaunt It, Feathered Nest, Foodtastic Friday, Show Me What Ya Got, Healthy Vegan Fridays, Wonderful Wednesday, Tuesdays with a Twist, Mostly Homemade Monday, Natural Living Monday, Simple Saturdays, Simple Meal Friday, Frugal Days, Sustainable Ways, Fight Back Friday, Whole Food Fridays, Gluten Free Friday, Pennywise Platter, Thriving on Thursdays, Full Plate Thursday, Wellness Wednesdays, Real Food Wednesday, Wildcrafting Wednesday, Fresh Foods Wednesday, Gluten-Free Wednesdays, Allergy Free Wednesdays, Simple Saturday, Happiness is Homemade, Gluten-Free Recipe Roundup, Turn It Up Tuesday, Hearth and Soul, Totally Talented Tuesdays, Tuesday Talent Show and Tasty Tuesdays. This entry was posted in Baking, Desserts, Recipes and tagged baking, coconut oil, cookies, dairy free, dessert, egg free, garbanzo bean flour, gluten free, refined sugar free. Bookmark the permalink. Jillian, you are really amazing. It is wonderful how much you are giving the world with your gifts and talents. Your website is lovely, your art is beautiful, and your blog is so rich with helpful information. (not to mention that your cookies are delicious!) Be proud and happy! Thank you so much Joy! I’m glad you enjoyed the cookies. What wonderful persistence to get these right. They are darling and I love Anna’s, so I’m sure they are tasty too. Thank you! Persistent and stubborn are two sides of the same coin. I’ve been called both. LOL! We have just sent you a message through your about me regarding our project. Full information has been sent to your about me. Thank you! I have already submitted my blog. Thanks for sharing this week on Wildcrafting Wednesday! Thank you for sharing this recipe at Simple Meals Friday! You’re being featured at SimpleFoody.org. I can’t wait to try these! Thank you for sharing these tasty cookies with Simple Meals Friday! We featured you this week! Oh wow! These sound wonderful! Stopping by via Simple Meals Friday!